Embracing an overview of Nervous System activities provides insights into Human behavior, and helps to lay a solid foundation for a successful Personal Development plan. To kick off this short overview of ﻿Nervous System﻿ activities, we can start by identifying the various components. Comprehending how our nervous system functions, both the voluntarily and involuntarily elements, makes it easier to respond to and influence our moods and behavior for our own benefit. At the same time, a thorough understanding of the Human nervous system is an indispensable aid when dealing with our fellows. We Possess One Nervous System comprising the following components, that in alliance with it's major component, the Brain, is capable of working in complete Harmony for the benefit of it's owner. The Central Nervous System is composed of the Brain and Spinal cord. 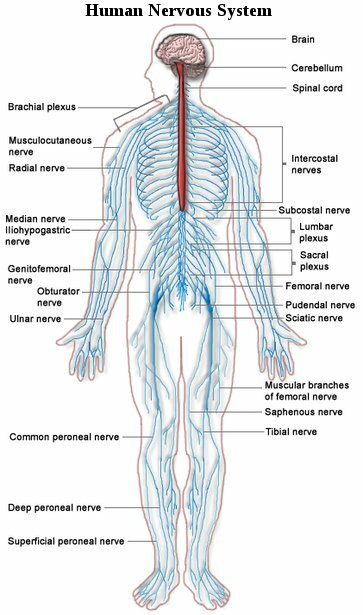 All the Nerves external to the Brain and Spinal Cord are considered to belong to the Peripheral Nervous System, which extends to the rest of the Body. By forming a vast network of Nervous connections to and from the Brain to all components of the Physique, the Central Nervous System manages the Body via the Peripheral Nervous System. Both the Voluntary and Involuntary systems are incorporated, and their functions are executed, within this network. The Human Nervous System can be divided into two distinct modes of operation, as follows below. Much Brain capacity is devoted to Involuntary functions, such as Blood Circulation, Temperature, and Sugar Levels. Breathing, Digestion, Damage Repair etc, and generally maintaining body Homeostasis. That is, Balanced Internal Conditions, regardless of the external environment. In common with many other creatures we are, in effect, self regulating, self maintaining, machines. Featuring powerful Emotions. Even with all our biological activities adequately catered for, the redundant capacity of the Human Brain is substantial, and can be considered to be available to devote to Intelligence. Brain structure automation leaves one free to concentrate on and develop this Intelligence. As it name suggests, the Involuntary System (Autonomic Nervous System) is entirely automatic. Although it is known it is possible for an indivual to gain Conscious control over Heart Beat, via biofeedback, and Consciously influence some other functions, as evidenced by a few extreme feats in extreme sports, it is not possible to Consciously override the Autonomic Nervous System and take complete control. Most of us would agree this is a responsibly we would prefer not to have to shoulder. But there is much we can do to alleviate the stress modern living places on our Involuntary Nervous System, by taking charge of our Voluntary Nervous System. 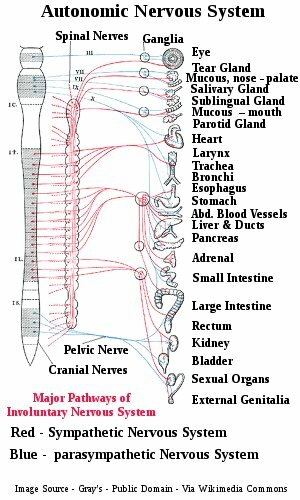 The Involuntary Nervous System is divided into two subsystems, known respectively as the Sympathetic and Parasympathetic. Elevating Heartbeat and Blood Pressure way above normal. Suppression of the Immune System. Shutting down the Digestive System. Increasing Blood flow to the Body Muscles by reducing the flow to the Inner Organs and Skin. Releasing Glucose from the Liver into the Bloodstream in expectation of extreme activity. Increasing Dilation of the Pupils to allow excess Light in, and often, some form of Sweating. Apart from increased Heart Beat from genuine exercise, and Sweating, all these conditions are disruptive to Homeostasis and detrimental to Health. Particularly long term Health, if the sympathetic response is permitted to persist. The Sympathetic System's counterpart, the Parasympathetic, works quietly and unobtrusively in the background to Maintain, Repair, Relax, and Balance the Body's requirements when the Sympathetic is not activated. In Modern Society our Parasympathetic Nervous System can endure an unnecessarily heavy workload. But, thankfully, by learning and applying the skills offered within Personal Development there is much we can do to reduce this inordinate burden. 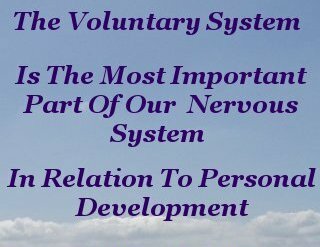 The Voluntary System is the most important aspect of our overview of Nervous System functions, in relation to Personal Development. This is the element of our Nervous make-up that permits influence over our Conscious physical activities, our Emotions, and our Thought. And it is, not surprisingly, the instrument used for Personal Development. Personal Development embodies nothing less than taking complete charge of, and responsibility for, this Voluntary System. One of the many benefits of taking charge is being able to beneficially influence your Autonomic Nervous System. For sound psychological and physical health. An essential step in the process of liberating your mind power. A definite realization, and belief that this responsibility of taking charge can be achieved, and maintained, underpins all progress one makes on his or her journey to enlightenment. Hopefully, this brief overview of Nervous System functions has whet your appetite to learn more about how you tick. The Human Nervous System Rocks!